Burlingame Avenue, 1915 Burlingame, California is a special place just 16 miles south of San Francisco. Incorporated in 1908, it has become a tree-lined suburb with a variety of home styles ranging from English Tudor and American Bungalow to Spanish Revival and Streamline Modern. Its rich and diverse history reflects the influence of the Spanish Ranchos as well as the area’s turn-of-the-century wealthy elite. Here you will enjoy photos, stories, memories and more. Burlingame, California is a special place just 16 miles south of San Francisco. Incorporated in 1908, it has become a tree-lined suburb with a variety of home styles ranging from English Tudor and American Bungalow to Spanish Revival and Streamline Modern. Its rich and diverse history reflects the influence of the Spanish Ranchos as well as the area’s turn-of-the-century wealthy elite. Here you will enjoy photos, stories, memories and more. Please join our $40 for 40 campaign. Consider donating $40 to celebrate our 40th anniversary. 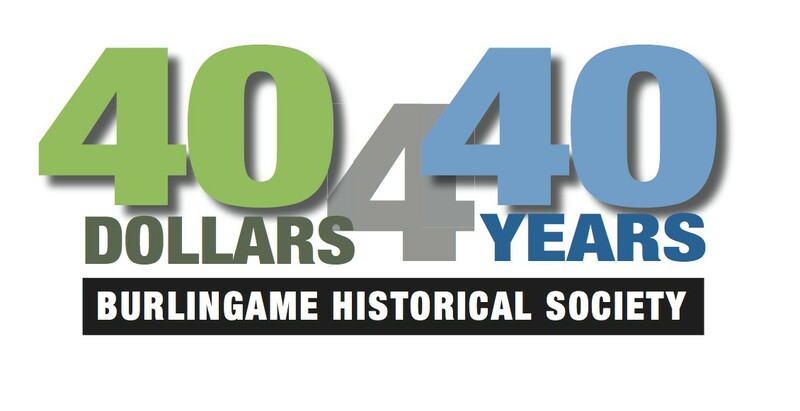 Please send checks to: Burlingame Historical Society, PO Box 144, Burlingame, CA 94011. Hey, and let us know if this is how you heard about it!